If you a looking for dwarf tree fern, Blechnum gibbum or ‘Silver Lady Fern’ could well be it. Used mainly as houseplant outside its native habitat it can be successfully grown in the garden in frost free areas. Unlike other tree ferns this dwarf variety is reasonably fast growing and the fronds will spread to over a metre in good conditions. It is naturally small. so it is sometimes referred to as the dwarf tree fern. If we look at its native habitat, Fiji, New Caledonia and the Pacific Islands, growing as an under story plant in forested areas we gain an idea of ideal growing conditions, filtered light and humidity, moisture. A humus rich moist but well drained soil is essential. Frost free and filtered light. Although Blechnum gibbum ‘Silver Lady’ could be grown indoors good air flow is essential. Poor drainage or very low humidity can cause the fronds to brown, older fronds will naturally turn yellow as they die off. Good moisture is essential, the soil can be allowed to dry a little between watering’s, however hot dry conditions are not suitable. We suggest a drip irrigation system if you are growing Blechnum gibbum ‘Silver Lady’ outdoors unless you have a naturally damp position. Check soil ph, Blechnum gibbum prefers a slightly acid soil. Try to use tank water or un chlorinated water as much as possible. Outdoors in the ground usually a top up of well rotted compost and mulch each spring will be adequate. In containers use a slow release general purpose native plant fertilizer. 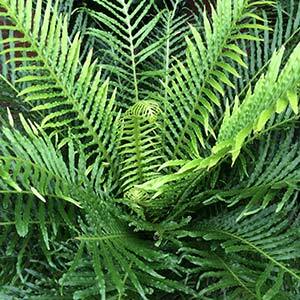 Used as a foliage plant, the Silver Lady Fern provides brilliant lush green foliage year round. Excellent in a container in a shaded position, as Blechnum gibbum ‘Silver Lady’ prefers filtered light it grows well on covered patios and decks, adding a tropical touch to an outdoor setting. As for height, Blechnum gibbum will reach around 1m (3ft), with a rather thin trunk. Climate – Tropical to sub tropical rainforest areas. Foliage – Glossy mid to deep green. Growth Habit – Rosette of fronds with a short trunk over time. Position – Shade / Dappled Shade – Not direct sun. Soil – Humus rich, moist with good drainage. Frost tolerance – Not suited to frost prone areas, however it can regrow after frost damage. Drought tolerance – Not suited to dry conditions. Pruning Time – Pruning is generally not required except for removal of old dead fronds. Regarded as Cat and Dog friendly. 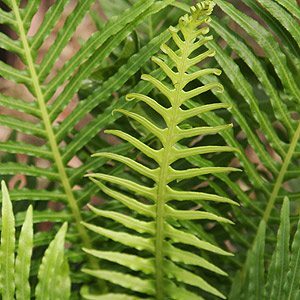 Blechnum gibbum is available for sale from the following participating nurseries.